We now sell the new Whammy 5th generation instead. The Digitech Whammy pedal is legendary for it's pitch shifting sounds. The Digitech Whammy was first introduced in 1991 and has swept the guitar industry ever since. Originally designed by IVL Audio, the Whammy has been heard on countless records and graces the pedalboards of millions of guitarists worldwide to this day. The Digitech Whammy is a pitch shifting pedal that also features harmony and detune functions. These functions are controlled by a built in expression pedal, similar to a wah, and allow the guitarist to alter tuning or harmony pitch in real time with their foot. No pitch or harmony style unit has made an impact this large on guitarists. From octave up to octave down or 5th to 3rd part harmonies, the Digitech Whammy is the most useful pitch correction tool for guitarists and is functionally perfect for live, studio, or home use. The harmonies are natural sounding and track unbelievably fast, the dive bomb function lets you pound away without going out of tune, and the detune mode yields a rich, deep chorus for those sparkling clean runs or your best power ballad melody. Added to everything else, you can control the Whammy functions via any sort of MIDI controller and there is a dry out for going direct or simulating stereo freak-out madness. Nothing short of nuclear holocaust can stop Digitech Whammy. The latest version of the Digitech Whammy pedal has added MIDI control and a divebomb function to the already impressive list of features. The Whammy features nine different harmony functions, two detune modes, and six different whammy functions. Here is a rundown of the front panel functions. All of these functions on the Whammy are controlled by the expression pedal. That means you can use the 2nd up-3rd up to simulate pedal steel licks or you can shift between a minor 3rd and a 3rd for quick bend lines. The Detune function adds a beautifully chorused sound that on the deep setting can yield Uni-Vibe style effects as well as a super wet chorus sound. The Whammy functions allow the player without a tremolo to dive bomb like they had a Floyd Rose as well as create screeching high notes that can put a hole in the toughest eardrum or super low detuned notes for thunderous riffage. Comes with 9v AC (not DC!) power supply for USA 120V power. Has a 2.5mm center barrel. In 1991 a legend was born. A new era in guitar effects began with the introduction of the Digitech Whammy. This pedal was (and still is) THE guitar pitch shifter and harmonizer. Packaged in a large, red metal case with a built in expression pedal, the Digitech Whammy brought about new guitar effects and sounds never before dreamed of by guitarists. At last guitarists could bend notes without going out of tune. Pristine octave up and down effects were now just a footswitch away and the amount of pitch shift could be controlled in real time. Not only did the Digitech Whammy offer great sounding harmonies, but using the expression pedal, you could bend between two harmonies with your foot! Nothing like this had ever been seen for electric guitarists and it immediately made its way into the rigs of influential guitarists and onto the albums of top bands of the time. Artists like Tom Morello and Dimebag Darrell made extensive use of the Whammy’s amazing tones and introduced aspiring guitarists to the true potential of this powerful pedal. Due to the huge success of the Digitech Whammy anther pedal was soon to follow, the Whammy II. This version featured a black chassis with expression pedal and a select footswitch for toggling settings. The Whammy II, while not as popular as the original Digitech Whammy, it featured fewer harmonies and only one Detune mode but had the ability to store a setting giving the guitarist the ability to toggle between two different settings with the footswitch. This was an invaluable tool for live performance. 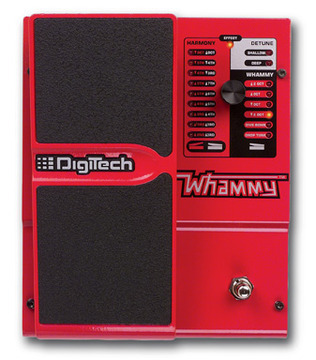 The Digitech Whammy II was heard being used by such artists as Herman Li, Trey Anastasio, and Buckethead. The next incarnation of the Digitech Whammy came in the form of the XP-100 Whammy/Wah. This creation incorporated wah pedal effects along with the Whammy. Now guitarists could use the unit as a Whammy, Wah, Volume, or Harmonizer. The different effects were available via a footswitch and there were 29 presets available for added versatility. The XP-100 did not enjoy as much success as the original Digitech Whammy due to its larger size and lower sound quality. It still was used by popular artists such as John Scofield and Munky. Then we had the Digitech Bass Whammy. This unit was blue and voiced specifically for bass guitar. The harmony options were different, incorporating harmony intervals that were more suited for the bass and caused less dissonance in the deep timbres it was made to effect. This was the first time bass players had a chance to enjoy the Digitech Whammy and a world of sounds were opened up for the four string maestros. The 4th down/5th up harmony being one of the most memorable harmony effects for the Digitech Bass Whammy creating speaker shaking dissonance that could be swept all the way up to a thunderous power chord blast of low end. The most recent version of the Digitech Whammy is the Whammy IV. This is a return to form of the original Whammy pedal with some modern upgrades to make it more versatile and usable. The Digitech Whammy IV features the addition of a divebomb feature allowing non-tremolo guitarists to achieve rocketing whammy bar effects without routing their guitars, buying new ones, or going out of tune. The Whammy IV also incorporates MIDI control of all expression pedal functions for external control or synching of the Whammy effects. Depending on signal chain placement the Digitech Whammy can yield different effects and sounds. Placed after a few overdrive and fuzz pedals, the tracking gets a little slower and the output gets more lo-fi for vintage squeak and squawk. When placed in the effects loop or first, the tracking is spot on even at the highest speeds and the effected signal is sent to your effects pedals letting them do the work. One of the cooler tones yielded by the Digitech Whammy is running a dry output into one amp and a wet output into another amp. This setup is super sweet for running thunderous harmony down effects adding a wide open sound and (depending on what kind of amp the effected signal is run through) major synthesis addition to your guitar.